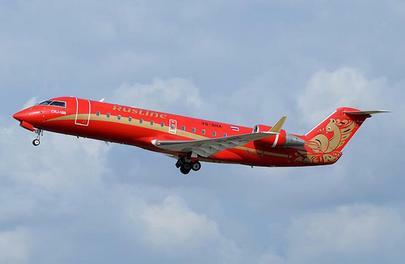 Russian regional airline RusLine has expanded its fleet with five Bombardier CRJ200s, the carrier’s deputy general director for commerce Alexander Krutov told Russian Aviation Insider. The spokesman explained that two aircraft have already arrived at their base in Moscow, whereas three more are currently being prepared for entering service in early May. All five aircraft are equipped with 50 seats in economy-class configuration. Alexander Krutov confirmed that the aircraft have been leased, but refused to disclose the lessor. On June 1, RusLine will operate the first flight to its new destination in Oslo from St. Petersburg. The Norwegian capital became the second international destination in the carrier’s route network, after Vilnius. Regional routes inside Russia remain at the core of RusLine’s business model. Krutov mentioned that the airline is satisfied with the results of the governmental support programs for regional travel. However, he said that the inflation level and rapid devaluation of the ruble is biting off the share of the subsidies in the regional routes economy. “The subsidies used to cover up to 80% of the direct expenses associated with the flights; it was easy back then to open new routes. Now, it’s 50% at best, so we have to work hard to attract passengers to break even.” Subsidies generate no more than 20% of the airline’s income, Krutov said. Speaking of further development, RusLine’s top manager confirmed that the plans for partnership with the S7 Airlines in terms of feeder flights are still being developed. “S7 is a member of oneworld, and they hold IOSA certificate. We are still working on ours, so we are currently undergoing some audits, after which we’ll proceed with our cooperation plans,” he explained. According to the airline, its fleet consists of 20 CRJ 100/200 and three Embraer 120s. In 2015, RusLine carried 578,800 passengers.